PLUS AN AMAZING BONUS – read below for the exclusive Adsense 100K Blueprint bonus! Adsense 100k Blueprint is an amazing Adsense system recently launched. This is one of the best step-by-step, indepth Adsense systems you will find. This system consists of over 100 pages in ebook format plus 8 instruction videos. A popular product that converts well and can earn you fantastic commissions. These articles were written specifically to use to promote the Adsense 100K Blueprint system, although the 9 Adsense articles can be used on their own and not just for promoting this program if you just remove any any reference to the A100KB product. This pack of articles contains nine articles on Adsense plus one 1126 word Review article for the Adsense 100K Blueprint system. You can use these articles for content on your website or blog. These articles range between 400 and 1200 words each. 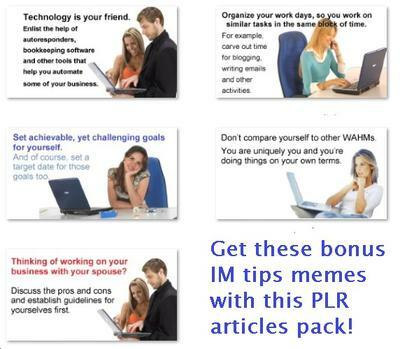 Included is also a set of IM tips memes to use in promoting your site.